The coastal shelf along this part of the Tuscan coast is really sandy and gradually slops into the sea, making it perfect for families with small kids during the day. The many shops and restaurants (as well as hotels) along the seafront also make the Versilia a great place to spend the summer, with everything you need within easy reach. 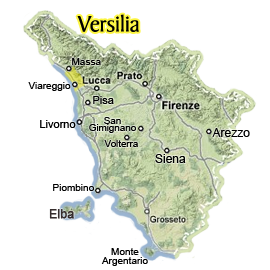 The main cities in the Versilia are Viareggio, Forte dei Marmi, Pietrasanta, Camaiore, Massarosa, Seravezza and Stazzema although the area spreads north along the coast and runs into Massa and Carrara. Seravezza and Stazzema are not along the coast but on the hills that slope up to the Apuan Alps, which sit right behind the coast and separate Versilia from Garfagnana and are called the "Upper Versilia". The climate here is quite mild, although humidity can get high in the summer. Why it is called Versilia? It is called after the name of the river that runs down from Seravezza down to Forte dei Marmi! Don't miss out on these marvelous places just because you choose to vacation without a car! Via bus or train - Versillia is so easy to explore!! Here is an easy to follow itinerary that you can use for your travels. A description of the beaches in Versilia: bathing establishments occupy almost all the coastline, while free beaches are quite rare and always crowded. This is the perfect destinations for families with children looking for services and total relax! All the details you need to go to the Carnival in Viareggio, the most famous and spectacular carnival in Tuscany. Information on the parades, dates and other useful details if you want to take part in the fun! Where to Park in Viareggio? Useful information for all those who decide to drive to Versilia and need to park their car. Park-and-ride facilities offer a cheap, comfortable and independent way for enjoying the beauties of Vesilia at best. Sitting on the sandy coast of the Vesillia, is the is the lively town of Viareggio. Explosions of colorful beach umbrellas, striking Liberty architecture and the passing parade of floats at Carnival time. A striking mix of a conflictual past with a fun and lively atmosphere today.